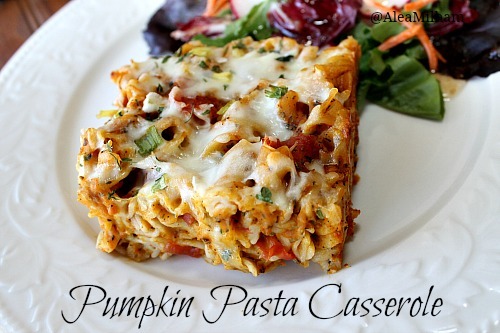 This quick and easy recipe for Pumpkin Pasta Casserole is perfect for chilly, fall evenings. If you are a gardener, you may only have to buy 2 ingredients to make this recipe: pasta and cheese. If you aren’t a gardener, it is still frugal as most of the produce is on sale right now. You can’t taste the pumpkin in the casserole. It adds a natural sweetness, nutrients, and color, but it takes on the other flavors of the recipe. The natural sweetness means you don’t have to add any sugar to offset the tartness of the tomatoes. My kids were at first horrified at the idea of pumpkin in a casserole. I think they were imagining the flavors of pumpkin pie and lasagna mixed together. I convinced them to try it and they loved it, but then they were disappointed that they couldn’t actually taste the pumpkin. Go figure! I used diced tomatoes in this recipe, if you have kids that don’t like chunks of veggies in their casseroles (I’ve gone through that with all three of my kids! ), you can put the diced tomatoes in the blender before creating the sauce. Preheat the oven to 375 F. Lightly spray a 9×13-inch baking dish with nonstick cooking spray. In a large bowl, combine pumpkin, diced tomatoes, onions, garlic, and spices. Sprinkle in a little salt and pepper. Add the drained pasta to the pasta sauce. Place the pasta with sauce into the casserole dish. Sprinkle the cheese over the top of the pasta. Top with extra onions and parsley. 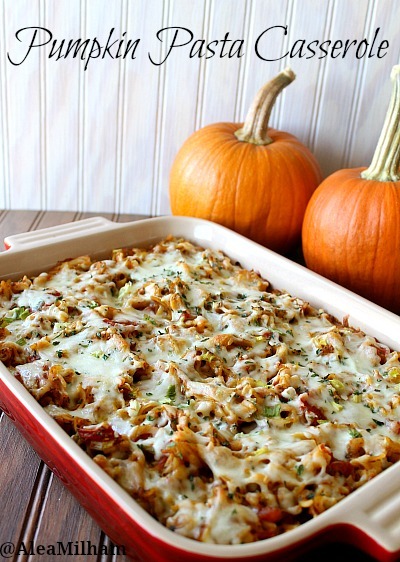 Serve Pumpkin Pasta Casserole with green onions garnish & side of veggies. I used mozzarella because it is my kids’ favorite cheese, but any cheese that tastes good with Italian food will work well. Looks deelish!! What type of pasta? I was thinking of using rigatoni! I love how yours looks like lasagna when sliced! I usually use penne or fusilli pasta, but you can use your favorite pasta. I think rigatoni would be great. oh ok …thank you! I think I’ll make it tonight with rigatoni. Have you ever added meat to this dish? I was thinking maybe ground turkey. Just curious if the spices would need to be adjusted if meat was added. It is delicious with meat. It works with any meat that would taste good in spaghetti sauce. You don’t have to adjust the spices if you add meat. I had such high hopes for this dish. It smelled amazing as it was baking. However, no one in my family liked it! I was the only one that actually ate it and it wasn’t my favorite either. At least it was very frugal so I didn’t feel as bad throwing out the leftovers. This looks delicious! What size casserole dish did you use? I used a 12 x 9 casserole dish. Just curious… Anyone tried freezing this? I temporarily have a family of two and baking half at a time would be easier!